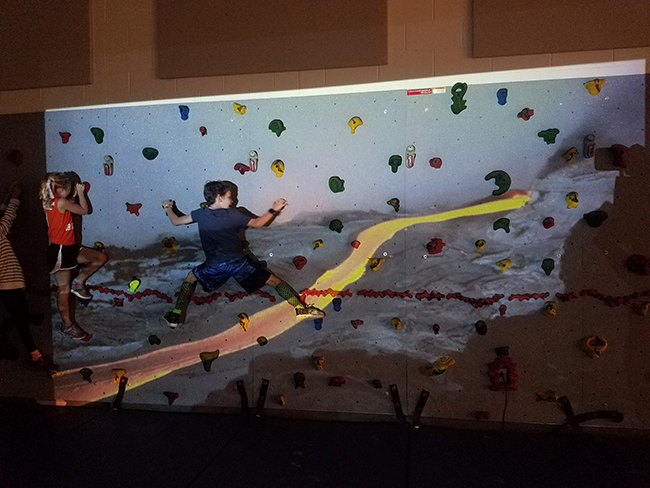 This activity gives students a creative and interactive way to traverse the Rock Wall. Students must pay attention to where the obstacles are moving so that they can move up or down the wall to avoid the obstacles. Practice climbing the rock wall with the lights on is helpful but not required. Want to create your own interactive games? Take Lindsayï¿½s course on our online school platform. 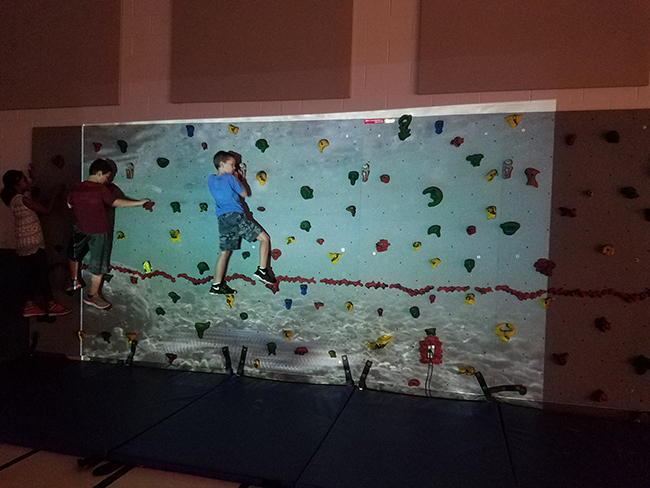 Using a PowerPoint presentation slides obstacles are projected onto the rock wall creating obstacles that students must traverse around so they can travel to the other side of the wall successfully. 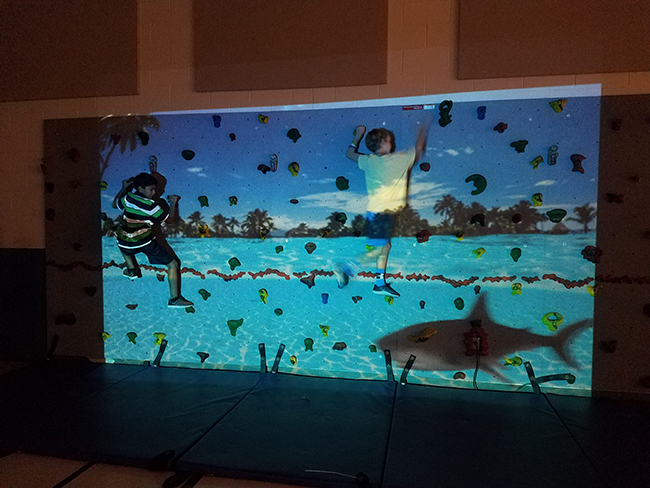 Students will adjust to each obstacle by climbing high or low on the wall, depending on where the obstacle is. The goal is to make it across the wall without the obstacles touching the area they are using to climb. See the virtual rock wall in action in the short video below. These are the PowerPoint Slides to use to project objects onto the rock wall. 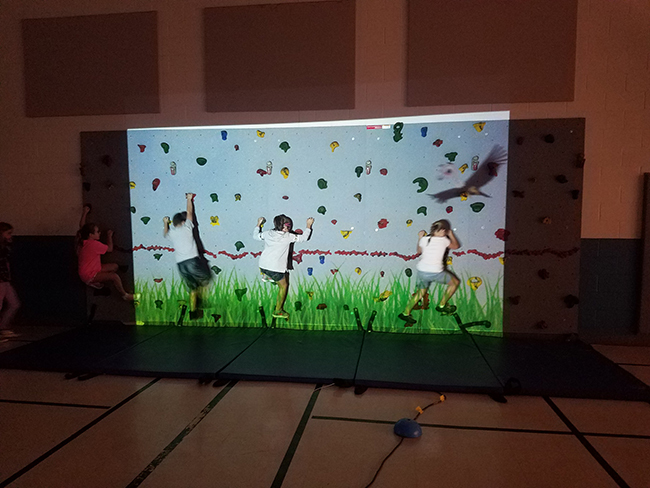 These are images of the children using the virtual rock wall. Click here to take our online course and learn how to make these presentations! Submitted by Lindsay Dillon and Scott Walker who teach at Pleasant Knoll Elementary School in Fort Mill, SC. Submitted by Lindsay Dillon who teaches at Pleasant Knoll Elementary School in Fort Mill, SC. Additional authors for this idea were Scott Walker. Thanks for contributing to PE Central! Posted on PEC: 10/10/2018. Viewed 5525 times since 10/4/2018.